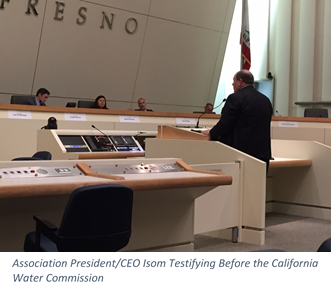 At a special meeting of the California Water Commission (Commission) in Fresno this week, President/CEO Roger Isom testified that the outcome of this effort must produce “real water.” The Commission held the “Water Storage Investment Program” meetings to provide an opportunity for stakeholders and the public to learn about the Commission's Water Storage Investment Program. In November 2014, California voters overwhelmingly approved Proposition 1, the Water Quality, Supply, and Infrastructure Improvement Act of 2014, affirming the need for a safe and reliable supply of water to support the state’s economy, environment, and quality of life. The bond includes $2.7 billion for public benefits of water storage projects that improve the operation of the state water system, are cost effective, and provide measurable benefits to the Delta ecosystem or its tributaries. The Commission, through the Water Storage Investment Program, will fund the public benefits of eligible water storage projects. The public meeting provided details on which projects are eligible for funding, the timeline for the program, and how to provide feedback on the program. Several participants, ranging from farmers and farmworkers to irrigation districts and county supervisors and elected officials, made comments generally supporting the construction of Sites Reservoir in the Sacramento Valley and Temperance Flat Dam near Fresno. Association President/CEO Isom urged for a comprehensive solution that includes the storage component to work towards solving all of our water problems.